This Elvis Presley biography elvis death page is dedicated to providing quality Elvis Presley biography information, pictures and articles for your entertainment. The contents of this Elvis Presley site is written by a fan for his fans about elvis death. On August 16, 1977, at his Graceland mansion in Memphis, Tennessee, Presley was found lying on the floor of his bedroom's ensuite bathroom by his fiancee, Ginger Alden, who had been asleep in his bed. He was transported to Baptist Memorial Hospital, where doctors pronounced him dead at 3:30 p.m. He was only 42 years old. In her 1987 book "Elvis and Kathy," friend and backup vocalist Kathy Westmoreland wrote "Everyone knew he was sick, that each public appearance brought him to the point of exhaustion." At a press conference following his death, one of the medical examiners declared that he had died of a heart attack. Heart disease was very prevalent in his family. His mother, Gladys Presley, died of a heart attack brought on by acute hepatitis at age 46. 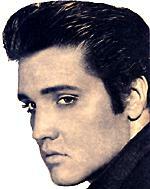 Elvis' father, Vernon Presley, died of heart failure in 1979. Dr. Willis Madrey, who had examined Elvis's liver in 1975, said, "I had understood he was having some gastrointestinal problems his doctors were trying to evaluate." Most likely, he was referring to Elvis' enlarged colon, which worsened over time and may have led to diverticulitis. It is believed that possibly his gastrointestinal problems, combined with a weak heart, caused his death; however, since the autopsy records will not be in the public domain until 2027, we will not know with certainty yet. There was little disagreement in fact between the two principal laboratory reports and analyses filed two months later, with each stating a strong belief that the primary cause of death was polypharmacy, and the BioScience Laboratories report ... indicating the detection of fourteen drugs in Elvis' system, ten in significant quantity." In his book, Elvis: The Last 24 Hours, Albert Goldman even went as far as to suggest that Presley killed himself by overdosing on a stash of drugs that he stockpiled. David Stanley, Elvis's stepbrother, who was at Graceland the day Elvis died, is said to have removed the needles and drug packets near Presley's body before the paramedics arrived, suggesting that he did not want to see Elvis's name tarred with the brush of suicide. On the other hand, some of his closest family members, friends, band members, and background singers have long disputed stories concerning Elvis's alleged drug abuse and "self-destructive" lifestyle. At the same time, they have not denied that he did take prescription medications for bona fide or suspected health problems. For instance, the late Vernon Presley, Kathy Westmoreland, the late Charlie Hodge, and the late J.D. Sumner have pointed out that Elvis also suffered from severe health problems unrelated to drug abuse. These health problems included glaucoma, insomnia, and bone cancer. The illness may have increased his dependency on prescription medication. Elvis Presley was originally buried at Forest Hill Cemetery in Memphis next to his mother. 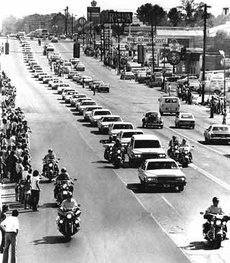 After an attempted theft of the body, his remains and his mother's remains were moved to Graceland. The Meditation Gardens, designed and built by architect and designer Bernard Grenadier, has been noted as a preferred place of Elvis in the property, where he often went to reflect on any problems or situations that arose during his life. Where he, his parents Gladys and Vernon, and grandmother are buried. The garden was opened to the public in 1978. An annual procession through the estate and past Elvis's grave is held on the anniversary of his death. The largest gathering assembled on the twenty-fifth anniversary in 2002. One estimate was of 40,000 people in attendance, despite the heavy rain. Description of Elvis Presley biography site contents: This site contains Elvis Presley biography information, Elvis Presley biography, history on Elvis Presley life story, Elvis Presley pictures and photos, Elvis death, Elvis Presley song lyrics, Elvis death, Elvis Presley movie resources, free e-books and articles listed for your convenient search in subjects of: Elvis Presley pictures and photos, Elvis death, Elvis Presley song lyrics, Elvis Presley movie resources, Elvis Presley childhood,Elvis death, Elvis Presley Band members biography, Elvis death, Elvis Presley girlfriends, Elvis Presley biography, Elvis death, Elvis Presley spiritual medium stories, Elvis death, Elvis Presley Memphis mafia stories, Elvis Presley biography, Elvis death, Elvis Presley diary quotes, Elvis death, Elvis Presley movie and music details in relation to the Elvis Presley autobiography and interviews of friends and family members for the Elvis Presley biography website written by a fan for his fans.